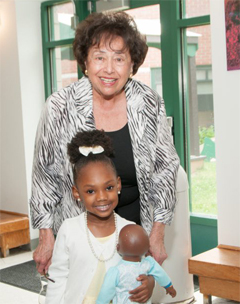 Congresswoman Nita Lowey held a June 11, 2018 press conference at the college’s Virginia Marx Children’s Center to announce multiyear funding of a grant for student parents. This $800,000 grant (about $211,000 per year for four years) will allow the college to provide subsidies for qualified, low income, Pell eligible student parents; assist the college in recruiting to enable more students to take advantage of the college’s childcare services; and provide student parents with additional support to help them achieve success as students and as parents.35 families will receive annual stipends through the Child Care Access Means Parents in School (CCAMPIS) grant. The college will develop a sliding scale based upon student need and the number of credits taken by student parents. The student parents may receive as much as $5,754 annually. Tina Jones’ daughter is Kayla and she is four years old. Tina had her daughter in childcare at another facility and she was considering a change. She heard a lot about our facility so she switched over and has been thankful for all the services offered here. When she came to the college with her boyfriend, the child’s father, they decided to attend the college as a group! Kayla, who is leaving the Center for kindergarten, did very well at the Center. Tina is taking Liberal Arts and is considering transferring over the Radiologic Technology Program. Her boyfriend, registered for Liberal Arts classes. They both made the Dean’s List and are continuing their studies here – he’s taking summer classes and she’s coming back for more classes in the fall. “It is a special treasure to be able to support our students and their young children at the same time. This is a unique place where our students come to achieve their academic and career goals while their children take part in an accredited curriculum supporting early childhood development, a distinction among child care centers. We are especially grateful for Congresswoman Lowey’s strong advocacy on behalf of Westchester Community College students and the award-winning Virginia Marx Children’s Center,” said Dr. Miles. The Center provides a nurturing environment that is safe and healthy. There are extensive opportunities for learning, physical development, culture, art expression, and language development. These offerings are important for the development of young minds and are aligned with research regarding learning and early child development. This grant shows the federal government’s commitment to helping parents achieve their college goals. There are current openings for the children of student parents and for members of the community. If you are interested in childcare, email vmcc@sunywcc.edu for details.